The Royal Pug serves such delicious food it’s surprising we don’t visit there more often but with an abundance of delicious eateries in town you can be forgiven for forgetting about old favourites. We had eaten an early breakfast so thought it would be a good idea to have an early lunch, well not too early it was 12pm. just. Neither myself or Mr Gourmand were hungry enough for what we consider to be a proper meal so we decided to just have a sandwich however we hadn’t anticipated that a sandwich at the Royal Pug would not be a small affair. Mr Gourmand couldn’t resist the Pulled Pork sandwich with a side of purple slaw. Served in a brioche bun and cooked with sautéed apple, the pulled pork was most delicious and certainly hit a spot. I had the fish finger sandwich which was also served with the purple slaw. It was around the time the chopping board was placed in front of me that I regretted ordering side dishes. There was no way I was going to finish the inch thick bread and giant fish fingers. In true Gourmand style we ordered sides of sweet potato and skin on fries. The sweet potato fries were hands down the winner in the side dish stakes. It was a case of eyes too big for belly for me however Mr Gourmand did manage to polish them off without breaking a sweat. The only downside about the visit for me had nothing to do with the food it was the serving dishes. I like plates. I like plates of different sizes and shapes as long as it’s a plate of the china variety. Chopping boards are as the name suggests for chopping, I don’t have anything against the little dipping pots but the little mini fryers and chopping boards are just a no no in my humble opinion. The Royal Pug can be found at 141 Regent Stree, Lemington Spa, make sure you’re wearing your elasticated pants before visiting though. After our disastrous visit to the Zizzi branch in Leamington Spa we decided to use the £20 voucher we had been sent at the branch in Kenilworth which is the next town to where we live. If I’m being completely honest I wasn’t expecting a great deal, I was praying that the food would be of a higher standard as it was nothing more than diabolical during our last visit and I knew it couldn’t really be any worse. We had booked a table for 12 and when we arrived we were the first ones there and were given a choice of where we wanted to sit, the restaurant was extremely light and airy and we picked a table next to a window and close to the door should we need to take Baby Gourmand outside when he became cranky which does happen often. After having a good read of the menu we ordered our starters, Bread sticks, Carrot and Cucumber for Baby Gourmand as part of his children’s menu. He was more interested in the colouring pencils at first but soon got stuck in to the breadsticks which he devoured with gusto. Mr Gourmand picked the Arancini (£5.45) which he had previously eaten at a hotel in London, Arancini are risotto balls with mozzarella, peas & a breadcrumb coating which was served with a chunky tomato pepperonata dip. The risotto balls needed the chunky dip as they were lacking something but that didn’t stop Mr Gourmand polishing them off. I really liked the sound of the Garlic bread with Mozzarella (£4.95) I was surprised when the dish arrived at how big it was, I had expected a really small bread but this was enough for two people. The caramalised balsamic onion was delicious, really sweet and decedent, I would order this again if I saw it on a menu. Once the starts were out of the way our main courses arrived, I had ordered Baby Gourmand the Bolognese again, it wasn’t as thick as I would have liked but it was a lot better than the portion we received at the Leamington Spa branch which was the consistency of a thin soup. Mr Gourmand hadn’t enjoyed the pizza he got during our last visit to Zizzi but decided to give them another try and ordered the Classic Fiery Nduja pizza (£9.95) which contained pepperoni, spicy Nduja sausage, green chillies, Fior di Latte mozzarella, riserva cheese & basil. Mr Gourmand really enjoyed this, the base was good and although the toppings were a little sparse they were very tasty and had a good amount of spice. Mr Gourmand thought my choice of main course was a little risky but I really liked the sound of the Classic king prawn diavola (£10.75) so ordered it any way. I must admit that I was a little disappointed when the dish arrived, I had expected butterfly king prawns as the menu suggested which when I have had them many times before are more of a flat prawn with the tail on, the prawns on my pizza just looked like regular supermarket king prawns, deveined straight out of the packet. Putting the appearance of the prawns aside, the base was cooked to perfection, it does look like there was quite a lot of chilli on the pizza but it was just the right amount without being too hot. Surprisingly we all had room for dessert, Baby Gourmand had vanilla ice-cream with popping candy and three mini cones. He hasn’t really had ice-cream before but seemed to enjoy it however I think the popping candy experience was a little lost on him. Mr Gourmand didn’t want anything too heavy so picked an ice-cream or Gelato if you want to be specific. Not wanting to be boring he went for the honey, sea salt and mascarpone (£4.45) which was a little bit special, it was sweet, salty and incredibly creamy. It was a no brainer for me when it came to picking a dessert, Tiramisu every time. The Tiramisu (£5.25)which is an espresso & liqueur-soaked sponge with layers of mascarpone & cocoa. Has my opinion of Zizzi changed? Yes it has, I was in two minds about returning and I’m really glad that I did. It’s good to know that the standard of food isn’t always as bad as it was during our visit to the Leamington Spa branch, the space issue we encountered during my last post was not an issue during this visit, in fact there was so much room we could have had three prams round our table. The staff could not have been more attentive at Kenilworth and I would not hesitate to return. 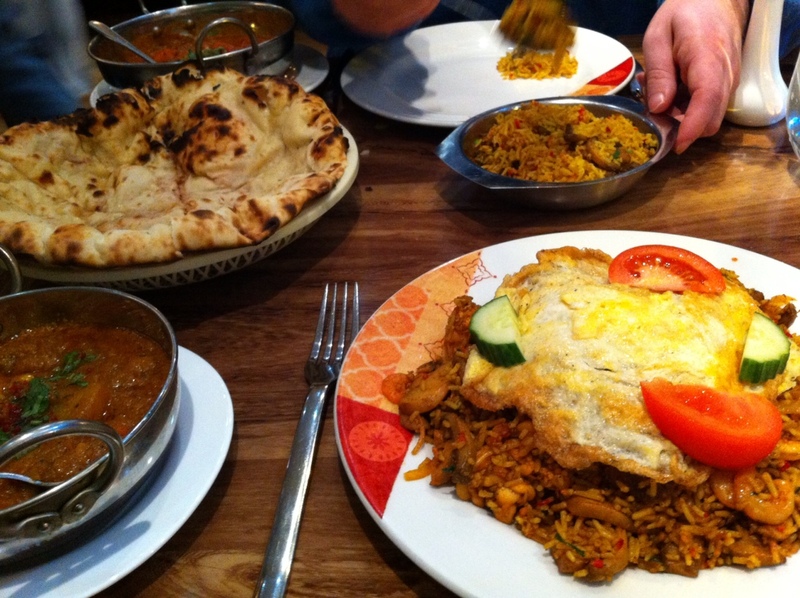 Panache Balti in Warwick is hands down our favourite local Indian restaurant, it’s delicious. Fact. We have visited several times and it’s our chosen restaurant of choice for a takeway (like last Friday night). We have wised up a bit when it comes to dining out at an Indian restaurant, in the past we would sit and munch our way through several poppadoms followed by starters, mains and sides and always wondered why we could only eat a forkful of our main dish before admitting defeat. Now we may have 2 poppadoms skip the starters and sides and go straight on to the main course. The restaurant is situated about 5 minutes walk from Warwick Castle so would be a perfect place to visit if you have popped to Warwick for the weekend. I love the décor inside, one wall features a huge drawing of the castle and I could just spend ages looking at it. I’m not sure what it is that keeps us going back time after time, obviously the food is delicious but Panache seem to just take it to another level in terms of flavour. Panache is a small restaurant and we have been only ever visited before 7pm so have never had to wait for a table, I’d imagine that it gets very busy on an evening so booking is probably recommended. There is a great variety of dishes and a few things I’ve never seen on a menu before like Mini Gourmand’s favourite dish of Paradise Chicken (£8.50) which is basically chicken tikka pieces cooked in a rich sweet creamy sauce flavoured with mango puree, dry mint, bay leaf, almond, coconut powder & mint sauce, if you like korma or chicken tikka masala then you will love this. I’m a bit of a creature of habit when it comes to Panache as I always go for the mixed Biryani (£10.75), my answer when questioned about this is always “Why wouldn’t you?” If it’s not broken don’t fix it. It’s a simple dish consisting of chicken, lamb, prawns, king prawns, mushrooms & pan fried omelette and depending on the chef you sometimes get pieces of pineapple. It’s far to big a portion for one person so we usually share it or take a container of food home. 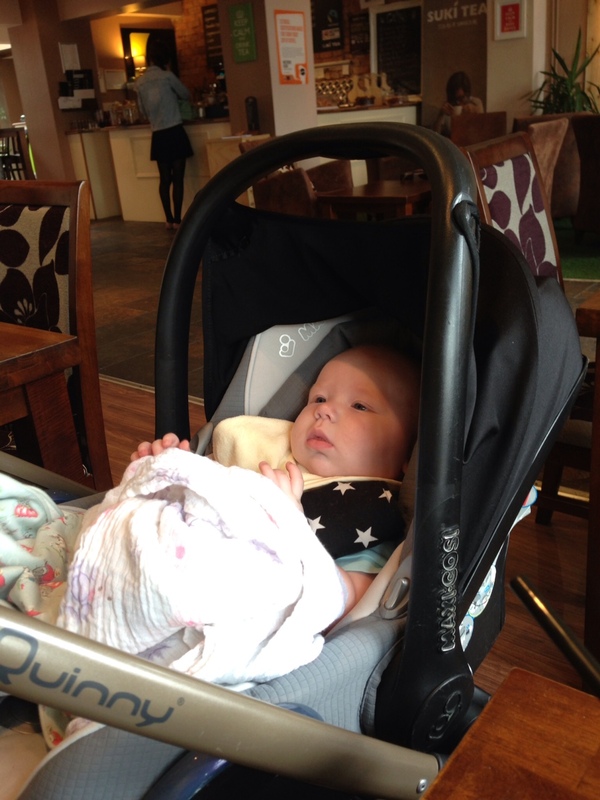 We usually alternate between a Peshwari Naan or Keema Naan (£2.50) depending if Mini Gourmand is with us or not, Baby Gourmand is partial to either. 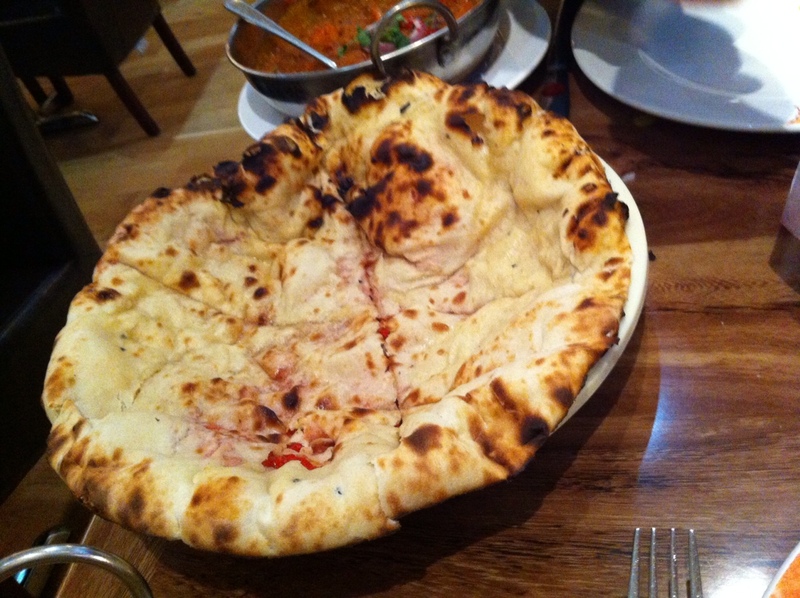 The Naan bread is always hot, filled throughout and huge! 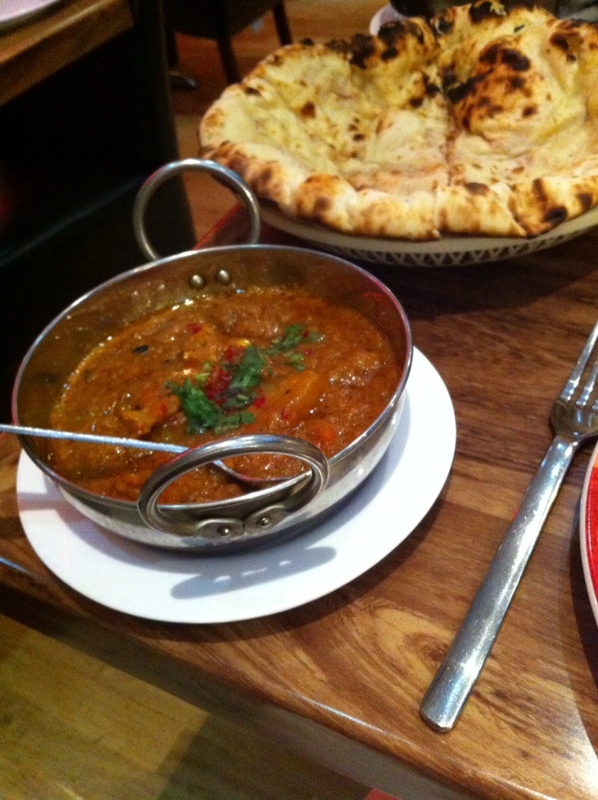 Grandma Gourmand is quite partial to a lot of heat from her curry and can quite often be found ordering a Naga curry (£8.95) which is cooked with aromatic flavoured spicy hot ghost naga from Bangladesh. I do have to admit that although it’s spicy it really is always delicious, it seems to have different levels of both flavour and heat which I’ve not found in a curry before. Last week I purchased our first Gousto box, it’s not something I would usually use as I like to visit my local butcher on a weekly basis and I grow my own veg but I was interested to see what this box was about and I knew that if I was intrigued by it that some of my readers would probably have been too. It’s always a bit of a risk signing up to a subscription service so I thought I’d give you a completely honest and Impartial review of the service. Signing up to the service couldn’t be easier, you visit the Gousto website, choose 3 recipes, select how many people you will need portions for 2 or for 4 people, Enter your post code, choose your delivery day and click “Continue”. If you have a discount coupon, you can apply it to your first delivery in the next step, before you click “Proceed to Checkout”. Complete the checkout process by entering your delivery and billing information. You will get a welcome email when you’ve successfully subscribed. You can pause or cancel anytime. There’s no club fee and no annual fee, you only pay for the food you get delivered. Whenever you’re on holiday, simply skip those weeks using the calendar function in your account. When pausing or cancelling deliveries, be sure to do so before the cut-off time of the delivery, which is always at noon on Sunday before the delivery. I have to admit when it came to selecting my choices there were only two dishes that I really liked the look of, it was hard trying to select the third dish and I took a bit of a risk as I wasn’t completely convinced I had made the right choice. I loved the look of the Chicken Cashew stir fry and the Kedgeree and my third choice was a Beet burger. My delivery was scheduled for Wednesday and arrived via courier, as I knew it was coming I made sure to stay in all day but it’s not something you need to worry about as you can leave delivery instructions when you order. The box was well insulated and the ice packs inside were still frozen which I was impressed with, the box can be recycled and I was impressed that brown paper bags were used instead of plastic. I popped the ingredient list on the fridge so I knew exactly what was needed for each dish and when it needed to be used by. I found this list incredibly helpful and it’s something I might start doing with my weekly meal planning to ensure I have everything I need for each meal. The first dish I cooked was Chicken Cashew stir fry, I dislike following recipes so this was a challenge in itself! I found the recipe incredibly straightforward although I did raise my voice a couple of times when I realised how many dishes and pans I ended up using to prepare/cook the meal. I was initially sceptical that we would be full after looking at the portion of rice and chicken as I would usually use twice as much. The end result was extremely satisfying and I was surprised at how much food I had made after my initial worry that we were going to be starving after we had finished our meal, if any thing I was really really full up. My only criticism if you want to call it that was that the dish was very salty, I hadn’t added any salt to the meal as I don’t usually use it so I think the salty taste must have come from the stock cube. Both myself and Mini Gourmand thought that this tasted as good if not better than some Chinese takeaway meals we have had so I will definitely be cooking this recipe again. The second dish was one of our family favourites, Kedgeree. I was really looking forward to cooking this as some of the ingredients and the method was completely different to the one I use. I’ve never added roasted tomato to kedgeree, in fact I don’t think I’ve ever used tomato in this dish at all. I was worried that using the whole pack of parsley might have been too much, I would usually use a sprinkle of coriander. I personally thought this was fantastic, I loved the addition of roasted tomato which added a delicious rich flavour, the chunky fish was great and it wasn’t overpowered by parsley like I had initially anticipated. Mini Gourmand practically inhaled hers which I think speaks for itself. The final dish was the one I was a little worried about, if I’m honest I wasn’t looking forward to cooking or eating this one. Both myself and Mini Gourmand love beetroot but we couldn’t visualise how this Beetroot Burger was going to taste at all. 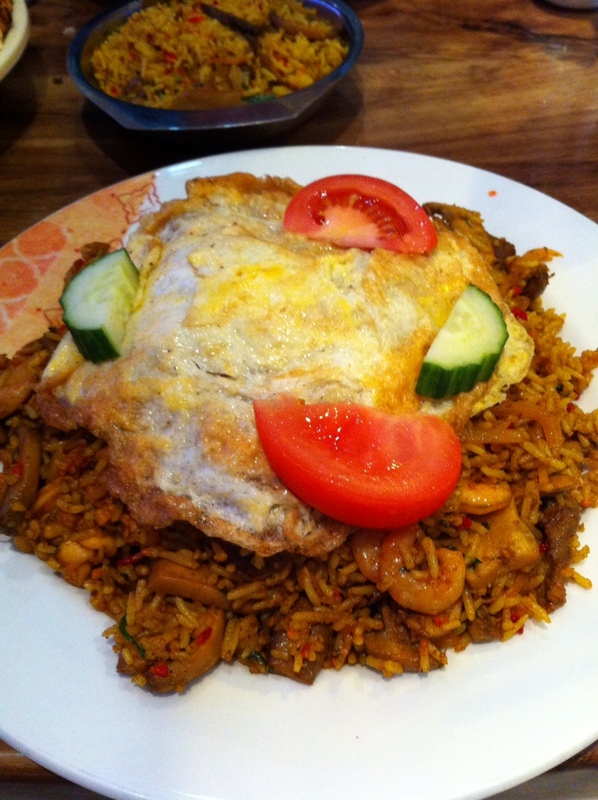 It just goes to show that you should never judge a book by it’s cover, we were both pleasantly surprised by this dish. I cooked my chips in the actifry as I find it doesn’t take as much oil but that’s the only time I swayed from the instructions. The tarragon mayo was absolutely delicious, I could have eaten a bowl full, the caramelised onions were to die for and the burgers were just delicious. Who would have thought beetroot and tarragon would have gone so well together, it was like a marriage in my mouth. Overall we were really impressed with Gousto, apart from the saltiness of the first dish we found that the portion sizes were perfect, the ingredients were just the right amount kind of like when you get a can of gin and tonic, it’s just the perfect amount but when you fiddle with a bottle of gin and a bottle of tonic you can never get the measurements right. Would I use it every week? No I wouldn’t because it doesn’t suit our family needs at all, for a family of 3 one of which is a toddler the cost of the box just isn’t affordable for us however as a treat now and again for myself and Mini Gourmand I would definitely purchase a box. We were discussing the box and when it would fit into our lives and we decided that if we knew in advance that we would be having friends over for a few days it would be more cost effective to order a Gousto box than to go out for a meal, or if were had just moved into a new property and didn’t want to go out and purchase lots of bottles and jars that we would only need a teaspoon out of then Gousto would be great. Gousto box is a fantastic idea, there is no doubt about that, if you would like to give it a try please feel free to use the money off code that was on my box, you could save yourself £20! Mini Gourmand is almost a teenager and is often asking if she can use the kitchen to cook a dish, I’ve tried to show her basic cookery skills but I worry about her when using sharp knives, hot ovens etc. 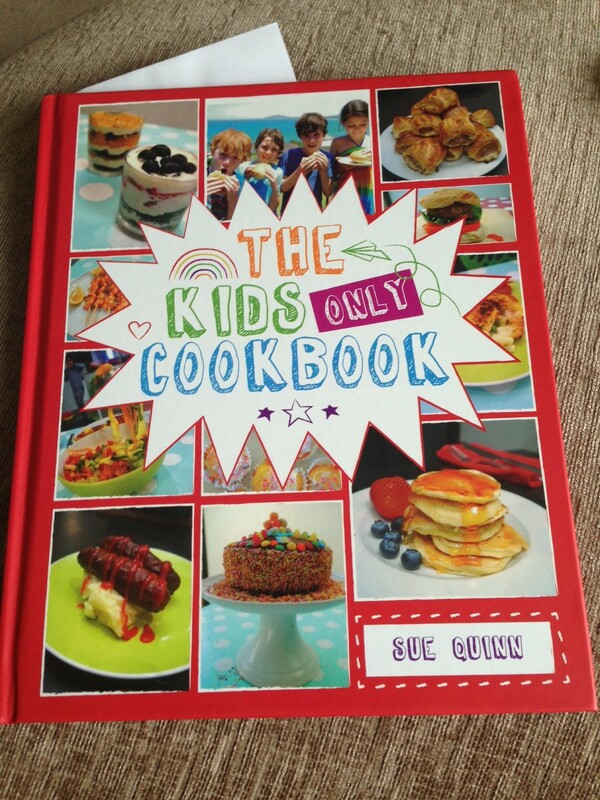 The Kids Only Cookbook is filled with safety information and advice when cooking and is packed with 50 simple, delicious and fun recipes containing easy-to-follow captions and 300 photos in a unique cartoon-style to inspire children of all ages to get busy in the kitchen. I particually like the sections which show a how to, each project is original and creative and inspires adults never mind children! 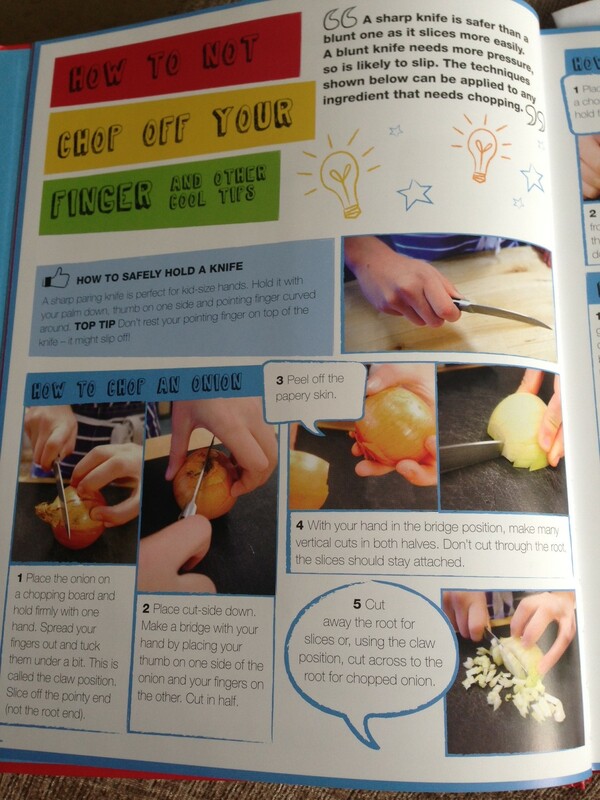 Kids will learn as they go along; each recipe contains a culinary technique such as beating, whipping, piping or baking and ‘Adult alerts’ appear throughout the book and ensure the recipes are all easy and safe to make. This is a book which will become treasured as it helps children to discover the endless fun to be had in the kitchen and to learn skills which will stay with them for life. Mini Gourmand particularly liked the way the book was written and the colours used, phrases are used like “Epic Fail” which is one of Mini gourmands favourite set of words when something goes wrong! We were not only provided with a copy of the book but also a kick’n’roll tin can to make ice cream, unfortunately Mini Gourmand went to Portugal on holiday with her grandparents with her camera and memory card containing her video of ice cream manufacture. It was really quite simple : pack a large tin can with ice and rock salt, insert a sealed ziplock bag containing cream, sugar and vanilla and kick it to the park or the beach…within 25 minutes…homemade ice cream! Mini Gourmand has already made a number of dishes out of this great book, I had a couple of pictures saved on my phone and have made the video below to give an idea how easy it is for children to follow the instructions themselves. Once Mini Gourmand returns from her holiday we will share our ice-cream making with you, for now though you can see how it’s done in the video below. We currently have post it notes stuck on the pages of the book that we wish to cook dishes from, I will try to either get pictures or video footage of Mini Gourmand cooking these dishes. On our current to try list are Chinese Fried Rice, DIY Fish Parcels, Sticky Toffee Pudding In A Jar, Fancy Lamb, Sherbert Dips and Rocky Road. If you are looking for present ideas for children age 7+ this would be a perfect choice and hopefully the child in receipt of the book might make you a thank you dish! *Disclaimer* I was provided with a copy of this book for review purposes, as always my reviews are honest and impartial and all thoughts are my own. The Sozzled Sausage is a bar in Leamington Spa that we have passed on numerous occasions, often when taking Mini Gourmand to Lantern Corner for sweets if she behaves, which is not that often! Anyway, we all decided to pop in for a quick bite to eat not so long ago, and we think this place is something special! 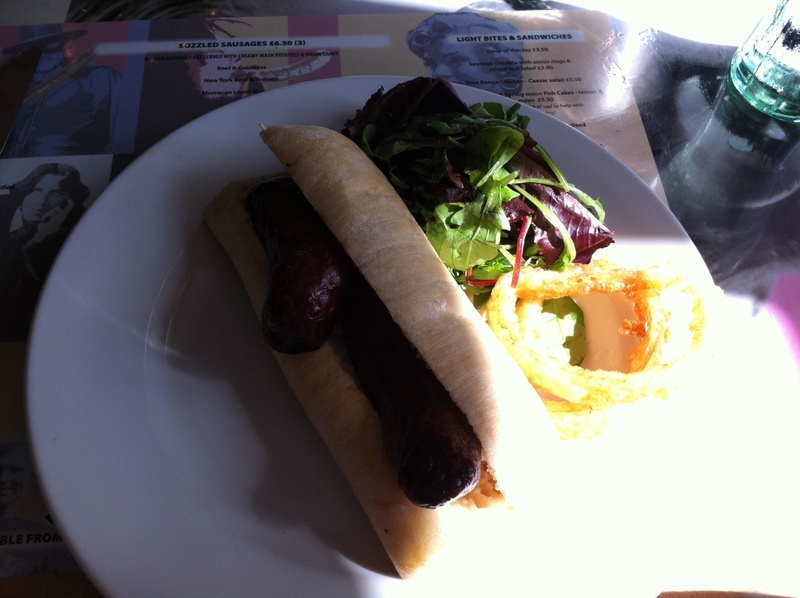 Mr Goumand had the sausage sandwich (£5.00) which was simple, tasty, excellent bread, nice side salad and amazing onion rings! oh my gosh those onion rings were good, so light and crispy and maybe, dare I say, the nicest onion rings I had ever tried!? tough call but for the moment, and unless my memory tells me otherwise by the time I finish writing this post I’m standing by that statement….the nicest onion rings I have ever had! 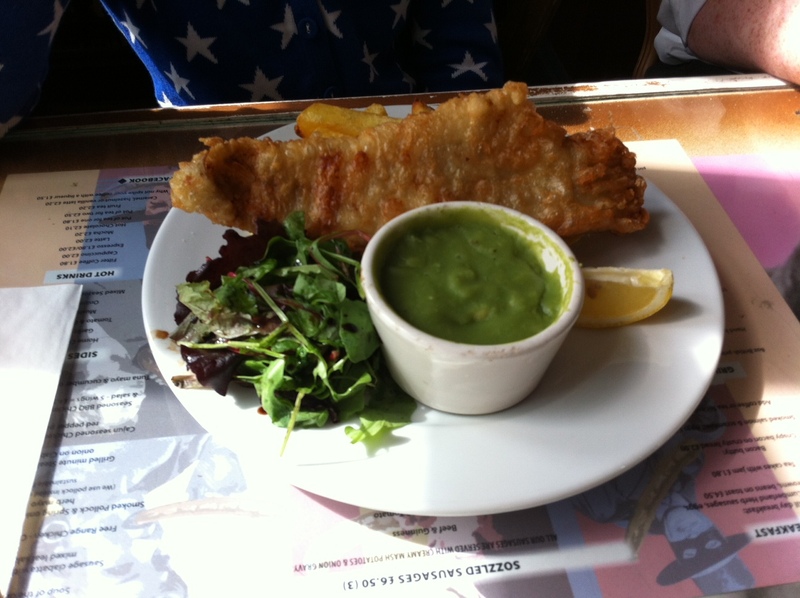 Mini Gourmand had the fish and chips (£7.50)! obviously feeling a bit peckish on this occasion. Huge portion and it looked very nice, I must admit I didn’t get a chance to try it because one minute it was there, a full fish almost bigger than her head, and the next, gone, just like magic. I’m not bothered, I’ll have it next time I visit! 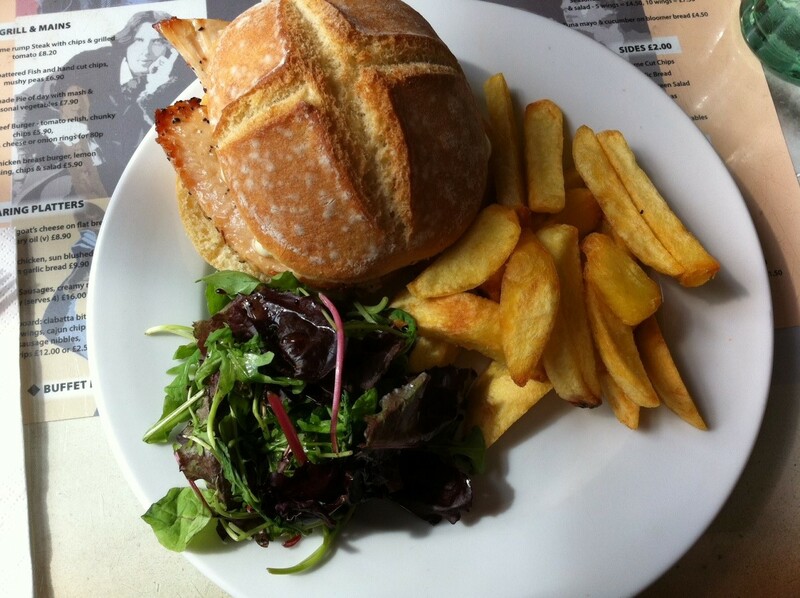 I had the Chicken Burger (£7.50) which was amazing. The bread, which I think came from a local shop, and the juicy chicken breast was out of this world, I couldn’t even finish it, it was that big and filling. Another tough call but again I’m going to make it, the best chicken burger I have ever had!!?? Oh and yes, the onion rings are the second nicest I have had, after some I made for Mr Gourmand a year or so ago…..where is that recipe again!? Those clever people at Schwartz have developed a new 2 in 1 range which takes the hassle out of cooking, who wants to spend hours midweek preparing rubs and herb mixes when you can prepare a dish in less than 10 mins? 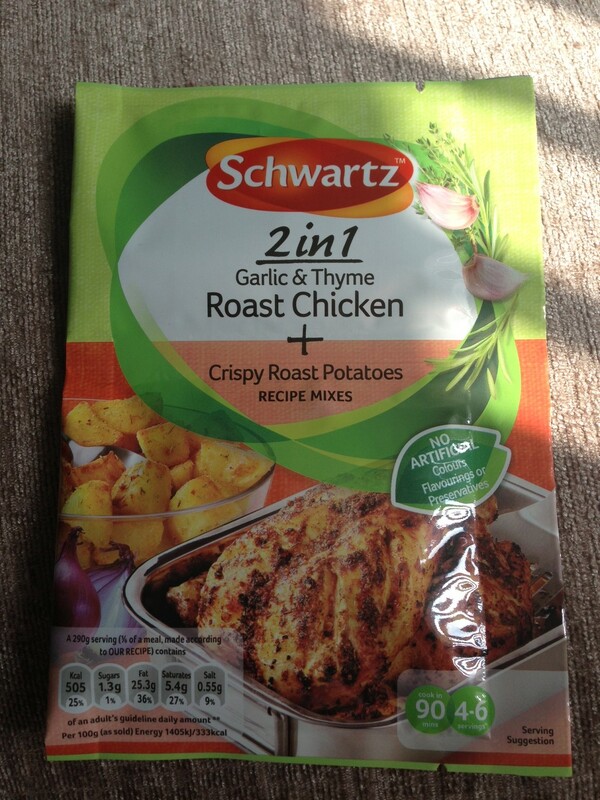 We were sent two packets from the 2 in 1 range, Mediterranean Chicken Pasta and Garlic & Thyme Roast Chicken. The new 2 in 1 range offers easy to use recipe mix sachets in one handy pack: One sachet flavours the main dish while the other contains a seasoning for a side dish or topping. 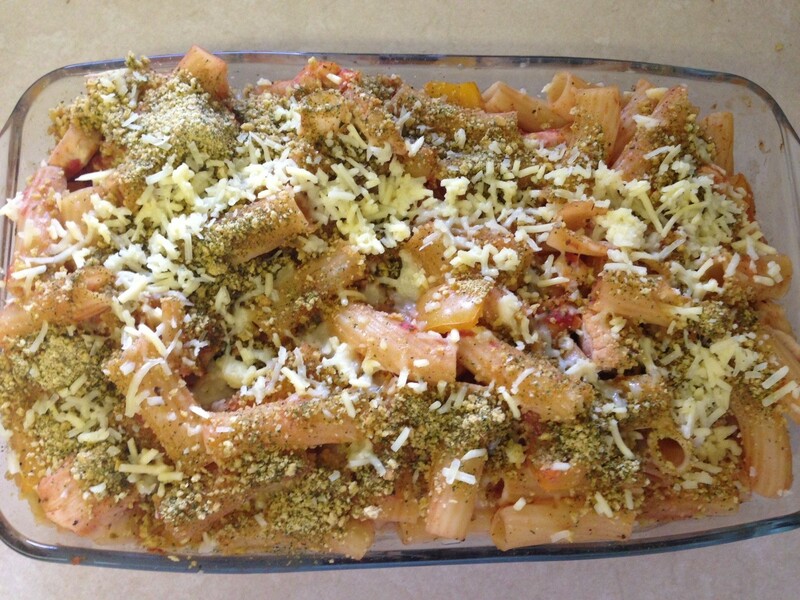 The Mediterranean Chicken Pasta and Cheesy Crumb Topping has a blend of herbs and spices which includes: Paprika, Turmeric, Black Pepper, Garlic Powder, Parsley, Oregano, Basil and Cayenne Pepper. The dish takes approx 10 mins to prepare and 4 mins to grill until browned. The pasta was a delicious alternative to our usual pasta bake recipe, I don’t usually use chicken in pasta recipes but it turned out to be a very filling meal. 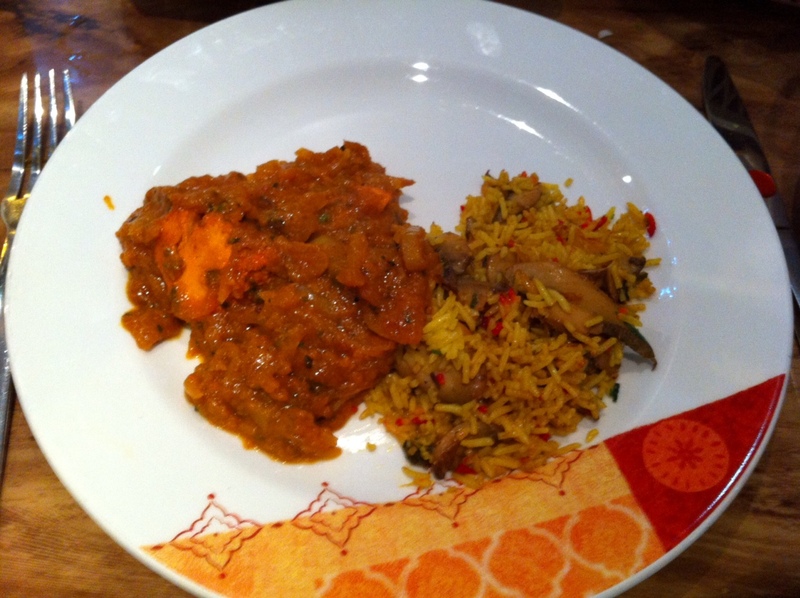 Vegetarians could omit the chicken and use a variety of vegetables like courgette and aubergine with the yellow pepper. Mini Gourmand loved the crispy crumb topping and thought it was a lot more interesting than just grated cheese. The Garlic & Thyme Roast Chicken with Crispy Roast Potatoes are exactly what they say on the packet. Some delicious flavours are used including Rosemary, Garlic, Paprika, Parsley, Nutmeg, Chilli, Marjoram, Cumin and Oregano. The dish takes seconds to prepare and based on my size chicken took just over an hour to cook. The family enjoyed this dish the most out of the two. 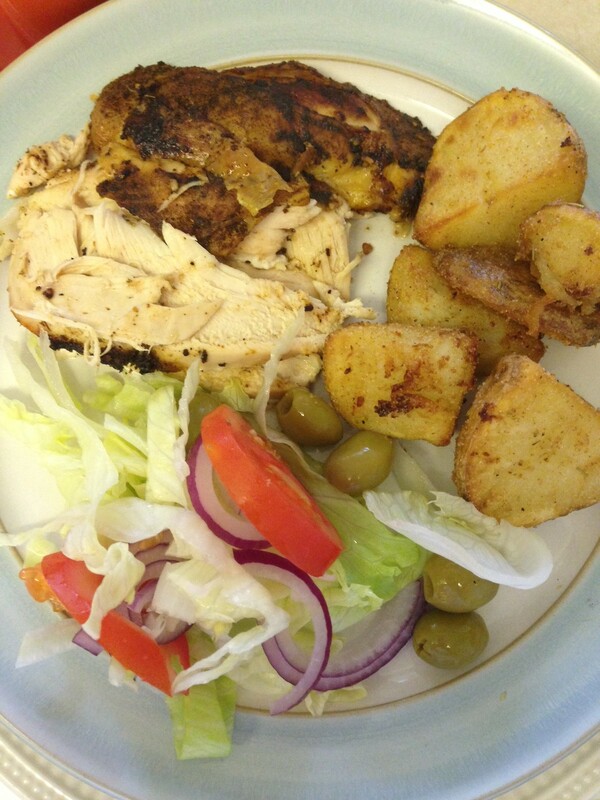 The rub for the chicken added a great flavour and the seasoning for the roast potatoes was subtle but delicious. I was really worried about serving the two dishes to Mr Gourmand as he is very anti packet food, I watched his face closely while he tasted the dishes to get an idea of what he thought of the food. 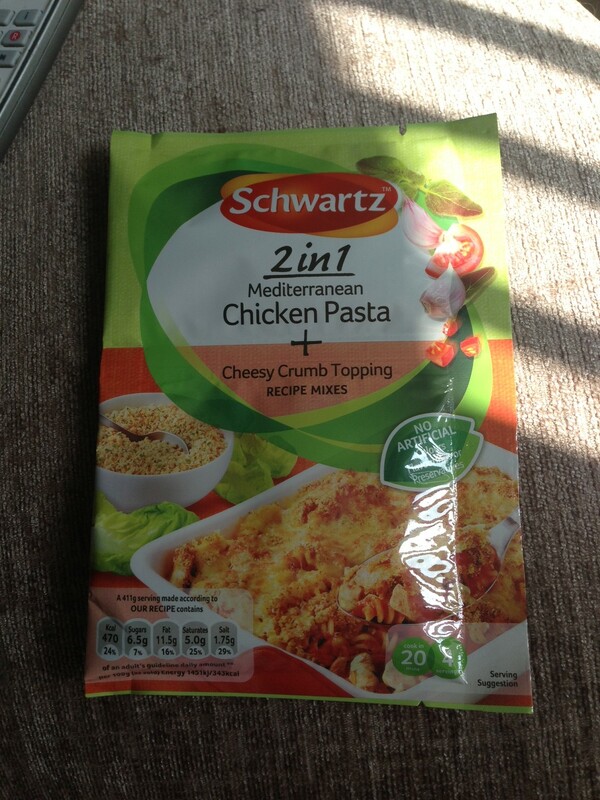 He admitted that although he isn’t a fan of packet mixes, the Schwartz 2 in 1 sachets really were delicious. Myself and Mr Gourmand love a breakfast in the morning, Mr Gourmand more so than me. He’s got this really annoying habbit of wanting to go out really early for his favourite meal of the day because during his studies he used to meet friends really early for breakfast as a way of motivating them all to start working first thing, and for some reason even now, all these years later, he likes to go out super early for a nice breakfast. Weird guy. 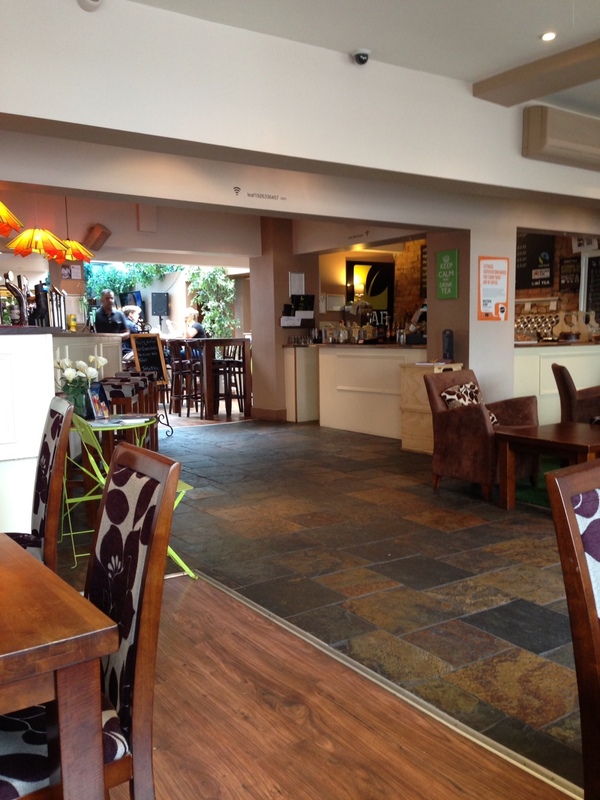 When we first moved to Leamington we popped into Leaf for a cold drink on a super hot saturday afternoon, we really enjoyed it and promised to go back, but for some reason never did. 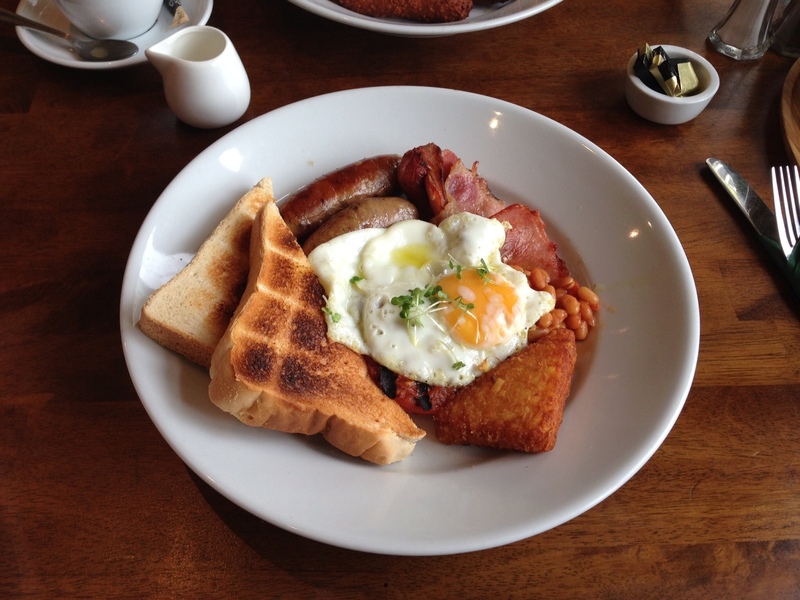 Anyway, during a recent shopping trip into Leamington centre, Mr Gourmand was wandering outside a shop waiting for me and was gormlessley looking through the window of Leaf, the breakfast menu immediately caught his eye, so the following week we went in to try it out. Leaf is lovely inside, very relaxing and bright. The place has two distinctive parts, a bright and airy entrance with seating near the window looking out onto the shoppers of Leamington, then at the back is an orangery type space with a large roof light where the piano player sits and plonks out tunes……..chopsticks, probably, maybe. Right, time for the food. 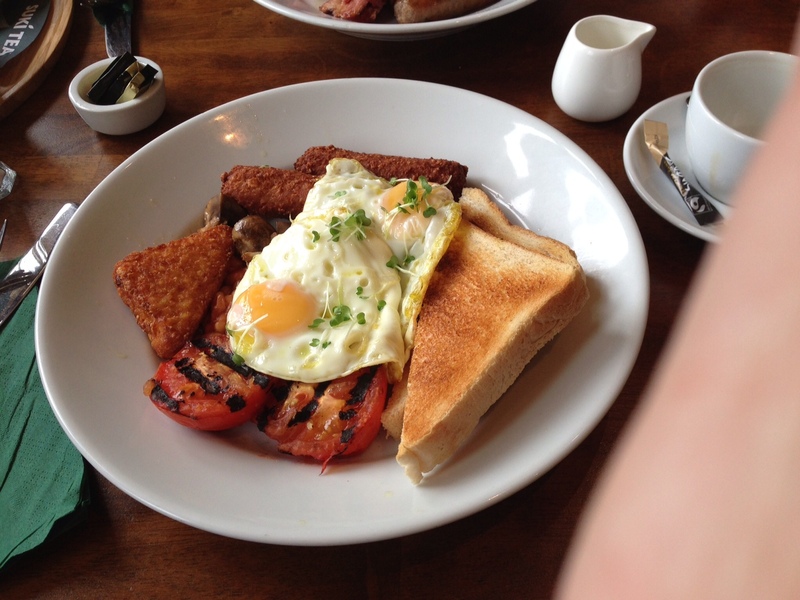 A Full english breakfast was Mr Gourmands unusual choice, for some reason he always goes for something smaller than a full english, then is gutted if he sees someone else with it and it looks better than what he decided on. So, this time he finally learnt from his mistakes and went for it. Wow was he impressed! Not massive, but the quality was outstanding – he even said it was certainly the best he could remember having. The sausages were quality, just as they should be, the bacon was out of this world, almost smokey like it had been done on a bbq!? Yum, he described it as delicious. As I am writing this he has just looked over my shoulder and has insisted we go again this morning….ok then, why not. I went for the Vegetarian Breakfast which was also amazing, the vegie sausages were excellent, so much better than the usual cardboard tasting things, in fact really quite similar to real sausages! As you guys know, I’m not a vegetarian, just don’t eat pork, so unless a place does beef sausages this is my only option, and boy what a good option it was! Everything oozed quality, the bread, the tomatoes, the eggs, even the nice cress touch added something unexpected from what was really an exceptional meal. Baby Gourmand even sat watching Top Gear on the tv giving us perfect peace while we finished our yummy food. Mini Gourmand even came to meet us, sadly too late for breakfast though….silly girl, that’ll teach you for being embarrassed to be seen in public with us!